Robin Youngs, Edward Fisher, Musheer Hussain, Jonathan Fishman,	The Journal of Laryngology & Otology, Volume 130 Issue 4, p 323. S Kumar, R Moorthy,	The Journal of Laryngology & Otology, Volume 130 Issue 4, pp 324-328. J C Rice,	The Journal of Laryngology & Otology, Volume 130 Issue 4, pp 329-331. H Skarzynski, M Matusiak, A Lorens, M Furmanek, A Pilka, P H Skarzynski,	The Journal of Laryngology & Otology, Volume 130 Issue 4, pp 332-339. 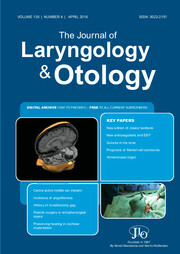 V A Savaş, B Gündüz, R Karamert, R Cevizci, M Düzlü, H Tutar, Y A Bayazit,	The Journal of Laryngology & Otology, Volume 130 Issue 4, pp 340-343. G Stoyanov, K Moneva, N Sapundzhiev, A B Tonchev,	The Journal of Laryngology & Otology, Volume 130 Issue 4, pp 344-347. I Ozbay, C Kucur, F Temİzturk, Y Ozkan, C Kahraman, F Oghan,	The Journal of Laryngology & Otology, Volume 130 Issue 4, pp 348-351. A Durmaz, A Kilic, R Gumral, U Yildizoglu, B Polat,	The Journal of Laryngology & Otology, Volume 130 Issue 4, pp 352-356. M A Bitar, J Nassar, R Dana,	The Journal of Laryngology & Otology, Volume 130 Issue 4, pp 357-362. A Mishra, S C Mishra,	The Journal of Laryngology & Otology, Volume 130 Issue 4, pp 363-368. Y Ozkul, M Songu, A Imre, E Tunc, Z Ozkul, S Arslanoglu, E Pinar, K Onal,	The Journal of Laryngology & Otology, Volume 130 Issue 4, pp 369-372. M B Asik, O Karasimav, H Birkent, A L Merati, M Gerek, Y Yildiz,	The Journal of Laryngology & Otology, Volume 130 Issue 4, pp 373-379. A Ghosh, K P Leahy, S Singhal, E Einhorn, P Howlett, N A Cohen, N Mirza,	The Journal of Laryngology & Otology, Volume 130 Issue 4, pp 380-387. M Dhiwakar, G I Nambi, T V Ramanikanth, S M Kale, M N Sivakumar,	The Journal of Laryngology & Otology, Volume 130 Issue 4, pp 388-392. G B Morand, J Madana, S D Da Silva, M P Hier, A M Mlynarek, M J Black,	The Journal of Laryngology & Otology, Volume 130 Issue 4, pp 393-397. M A Buchanan, F Riffat, C E Palme,	The Journal of Laryngology & Otology, Volume 130 Issue 4, pp 398-400. A Gungadeen, R Lisseter, J Manickavasagam, V Paleri,	The Journal of Laryngology & Otology, Volume 130 Issue 4, pp 401-403. J F Polanski, A D Soares, Z M Dos Santos, O L Mendonça Cruz,	The Journal of Laryngology & Otology, Volume 130 Issue 4, pp 404-407. R Omichi, S Kariya, Y Maeda, K Nishizaki,	The Journal of Laryngology & Otology, Volume 130 Issue 4, pp 408-411. Z-C Lou,	The Journal of Laryngology & Otology, Volume 130 Issue 4, p 412. R Mills,	The Journal of Laryngology & Otology, Volume 130 Issue 4, p 413. R Shankar, R S Virk, K Gupta, AK Gupta, A Bal, S Bansal,	The Journal of Laryngology & Otology, Volume 130 Issue 4, pp 412-413. R Shankar, R S Virk, K Gupta, AK Gupta, A Bal, S Bansal,	The Journal of Laryngology & Otology, Volume 130 Issue 4, pp 413-414.